Merkel reigns on as German Chancellor, but who will partner her? Chancellor Angela Merkel and the Christian Democratic Union (CDU) gained their expected victory in Sunday night's Federal Election, taking 33% of the votes – but crucially, not enough to form a single-party government. Unlike many countries, Germany rarely emerges from an election with a complete majority. But it's still hard to ignore the fact that this is the CDU's worst election result under Merkel's leadership, and with new political alliances available, negotiations to form a coalition could yet take weeks. 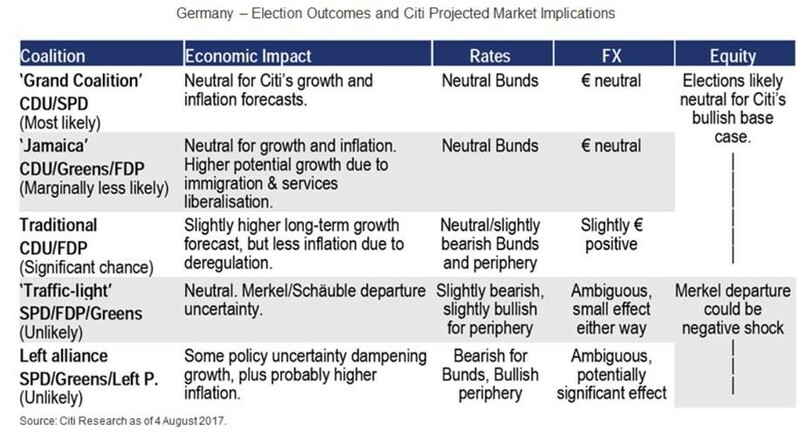 On a global scale, Citi analysts expect markets to remain relatively stable, but any shifts will of course depend on the party or parties that Merkel opts to partner with. The Social Democratic Party (SDP), who have worked with the CDU since 2013 in an arrangement known as the Grand Coalition, also performed worse than anticipated – their total of 21% was their poorest result since World War II. Citi analysts expected a renewal of the partnership to be the most likely post-election scenario, but instead the SDP have indicated they will move forward as an opposition party. The SPD's manifesto promised higher taxes for higher earners and a drive to invest in the country's education and infrastructure, but it remains to be seen how they will effect change from outside the coalition. Of course, if talks fail with other parties, Germany may have to fall back on the option of a Grand Coalition once again. With 13% of the vote, the far right Alternative für Deutschland became the first nationalist party to gain a Bundestag presence in over half a century, though much will depend on their reaction to the surprise resignation of co-leader Frauke Petry. However much their politics of populism resonate with the German people, Citi analysts do not expect the AfD to exert much of an influence on the country's economy. Their opposition to both the European Union and euro puts them firmly in the minority among German parties. Citi analysts now anticipate a three-way coalition between the CDU, Green Party and the Free Democrats (FDP). Known collectively as 'Jamaica' – a nod to the black, green and yellow party colours that reflect the country's flag – this tripartite government could redefine German politics, with a higher potential of growth for investors. All three parties are also united in their support for the EU, though the FDP are less keen on setting aside budget for a Eurozone fund1. Still, Citi expect Germany to continue to help shape continental politics. After a slump in 2013, the FDP has gained a surge of momentum, thanks in part to its charismatic leader Christian Lindner. On immigration, the party seeks a modern migration law combining humanitarian responsibility with economic needs. Its focus is on education2, with a view to creating better employment opportunities in Germany, and investment portfolios could benefit as a result. The Greens, meanwhile, would like to phase out fossil fuel usage – particularly that of coal – and invest instead in renewable energy, which could bring about new jobs in an emerging sector. Although the Jamaica coalition appears the most viable option for Germany at present, it could require both the FDP and Greens to compromise on some of their more left-leaning policies. Both parties are at least publicly bullish about their position at present, though the responsibility of forming a stable government may force all parties' hands. The CDU is popular with Germany's conservative middle classes, while the business-friendly FDP often wins with the young entrepreneurs of the free market. Citi analysts think it's easy to see how a combination of the two could appeal to the masses. The FDP, or liberals as they're also known, take a relaxed approach to government's involvement3 with businesses and have a stoic faith in the free-market economy. A coalition of the two could see a relatively positive impact on the equity markets due to growth-oriented policies the liberals may introduce. With Merkel remaining at the helm, market implications are expected to be limited, particularly from any policy exercised by the CDU itself. Indeed, any changes in markets or FX would likely come from the partnering party or parties enforcing their plans to spend more money. The FDP suggested international security spending should be raised to 3% of GDP, the Greens would try to push through ecological and educational changes, and – if called upon – the SDP party would likely look to fulfil their promise to put an extra €30bn into infrastructure over the next four years. Whatever the outcome, Citi analysts believe the German economy looks likely to strengthen in the coming months. We anticipate two rounds of tax cuts in the near future, with the first in 2018, and anticipate middle income households receiving income tax reforms of up to €15bn (0.5% of GDP). With the expected slight shift to the left, public investment will likely increase by around 0.2% of GDP from 2018, and that should prove a boost to sectors from energy to transport, education, defence and digital. Indeed, Germany's economic prospects and what they mean for the Eurozone help outline why Citi places such confidence in European equities. Valuations remain quite attractive at 14x 2018 forecasted price to earnings ratio, and corporate earnings are likely to rise 12.5% in 2018 too. If you'd like to know how the German election or any other political event could affect your investment portfolio, speak to your Relationship Manager today.